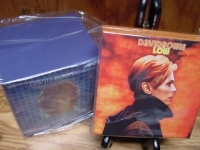 "David Bowie, Low - OBI Box Set of 5 Minis"
DAVID BOWIE - LOW - Japanese OBI MINI REPLICA LP TITLES making a 5 CD Box Set- Japanese OBI MINI REPLICA BOX SET Japanese re-mastered Mini LP replica Limited Edition Collection Recorded from the finest Original Masters available. Special VERY RARE LIMITED EDITION BOX SET ONLY PRODUCED ON FUTURES FOR THIS ONE TIME PRESSING -- were only available in Japan. Limited Japanese box contains FIVE paper sleeve versions of Limited Edition Japanese Box Set that Includes the 2007 LP Replica Sleeve Editions of "Diamond Dogs", "Young Americans", "Station to Station", "Low", "Heroes", and "Lodger". Track Listings 1. Future Legend 2. Diamond Dogs 3. Sweet Thing 4. Candiate 5. Sweet Thing (Reprise) 6. Rebel Rebel 7. Rock 'N' Roll With Me 8. We Are The Dead 9. 1984 10. Big Brother 11. Chant Of The Ever Circling Skeletal Family 12. Beauty And The Beast 13. Joe The Lion 14. Heroes 15. Sons Of The Silent Age 16. Blackout 17. V-2 Schneider 18. Sense Of Doubt 19. Neukoln 20. Secret Life Of Arabia 21. Speed Of Life 22. Breaking Glass 23. What In The World 24. Sound And Vision 25. Always Crashing In The Same Car 26. Be My Wife 27. A New Career In A New Town 28. Warszawa 29. Art Decade 30. Weeping Wall 31. Substerraneans 32. Stationtostation 33. Golden Years 34. Wordonawing 35. Tvc15 36. Stay 37. Wildisthewind 38. Young Americans 39. Win 40. Fascination 41. Right 42. Somebody Up There Likes Me 43. Across The Universe 44. Can You Hear Me 45. Fame 46. Sigma Sound 47. Electric Lady 48. Record Plant These are Japanese digitally re-mastered Mini LP replica CDs (the OBI Edition). This Limited Edition Collection has only VERY FEW made world-wide and are immediately Out of Print. Recorded from the finest Original Masters available. Comes with anti-static sleeves similar to Vinyl LPs, Cardboard packaging like an LP, includes extensive Liner Notes Booklet. Actual miniaturized version of the 12inch LP in 4inch CD version.